NIMBLEX 2008 "DISTRO WITH SMALL SIZE"
Currently in the world of pop has many new distributions-distributions, is one of nimblex 2008, which is a continuation of previous versions, namely nimblex 2007. 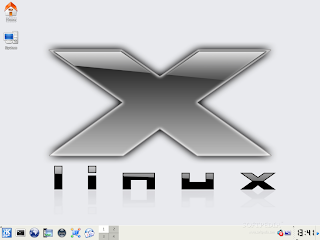 Nimblex distribution is derived from the distribution SLAX, while SLAX itself is derived from the slackware distribution. So can be said that nimblex is the granddaughter of Slackware. Size nimbleX 2008 is quite small, less than 200 MB, with the distribution of this we can try compiz Fusion, and various other interesting applications. These distributions can be run from the CD (live CD) or installed on the hard drive or bring. The installation is simple enough, because during the process inistalasi we will not be asked to partition and Linux native for linux swap. The installation of this distribution is actually the process The folder / boot and the folder / nimblex to the hard disk and pen-setting of the bootloader. Package applications in the distribution of this compress *. lzm in the form of applications that are essential as the kernel and base system to additional packages that are as KOffice etc.. We can also add applications package that we need a way to download the package from http://extends.nimblex.net *. lzm in the form of coffee and then we file to the directory / nimblex / module without the need through the installation process. the package is automatically activated when the system is run, with a note that nimblex 2008 has been installed in hardddisk atapun bring. nimbleX 2008 because the distributions are based live script, so any changes we make to nimblex will not be saved unless we have allocated a special space / folder diharddisk to mrnyimpan results of these changes. Directory is a directory change that we made, that we will use as a place to store the results change the settings on nimbleX 2008.